I couldn't help to find this new edition to the Meiji Chocolate Stick line-up. I mean, the package was practically glowing on the store shelf! The last yellow lemon flavored chocolate I had tried was the Kit Kat from a few years back and I loved that one. This one looked very promising since it contained 26% real lemon juice. Also, I figure Meiji makes the tastiest mass-produced chocolate in all of Japan. This flavor is the fifth in a series of chocolate sticks by Meiji. Previous tastes included: Earl Grey Tea, Cinnamon, Feel Mint, and 72% Cacao. We list all of them HERE if you are interested. All boxes from this series are the same size (11 x 7 x 2 cm) and each contain 6 foil wrapped sticks that measure 8 cm. As soon as the chocolate is removed from the foil there is a very pleasant and strong smell of lemon. This is a white chocolate based product so it is more delicate than standard milk and bitter chocolate. It is very easy to melt the chocolate with your fingers so it is best to be popped into your mouth immediately. The taste hit me right away. Plenty of lovely, sour lemon flavor escaped as the chocolate explored my entire mouth. You really don't need to chew this as the heat of your mouth will melt it quickly. One stick contains 30 Calories so there is plenty of sweetness too and that really goes well to balance the sour lemon juice that is contained inside the chocolate. I really needed more than one stick because these were just delicious. 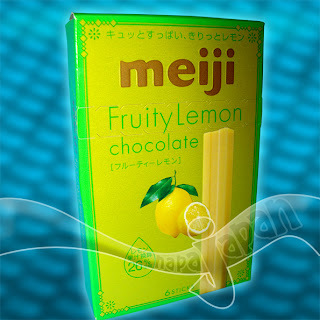 Try Meiji chocolate in many forms. We carry the classic Choco Baby and Kinoko No Yama too. All of the new release chocolate we offer as a best before date of at least 6 months. In summer months it is best to put your chocolate in the refrigerator for an hour upon its arrival just to firm it up so it easier to handle. Hi Chew "Henshin" Orange + Banana = Soda? ?